Matchmaking has always been a responsible task. Earlier, the older members of the family were responsible for finding a perfect match for the eligible one in the family. People were not allowed to see their "would be" wife or husband before marriage. This age-old traditional practice has vanished with the emergence of the new technological age. 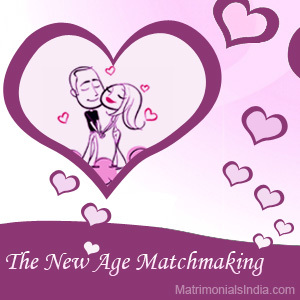 Nowadays, people find their suitable match on their own, just by simply registering them on matrimonial websites. These matrimonial website provide unending matchmaking services. With the advent of internet, matchmaking has been an easy task. The parents are not the ones, who are responsible to choose a perfect match for their children these days. They have adopted a more modernized approach by letting their children make the right choice. With the help of these matchmaking sites, finding a life partner is just a click away. A matchmaking service essentially takes on the full responsibility of finding you a match. These sites have sophisticated experts that look through your profile and match you up to the most compatible people. How to find an ideal match online? The traditional method of finding a perfect life partner is been replaced by these matrimonial websites. They act as a common link between people who are looking for their suitable match. You just need to register with the website and attach your details like name, date of birth, religion, caste etc along with a photograph. Rest of the work is done by the website. They will match your profile with the profile of suitable person and they will send you the details. You can refer to those details and choose to meet that person and know more about him, if you think that person is suits the description you gave. Moreover, this process is very confidential and consumes less time than the conventional method of matchmaking.